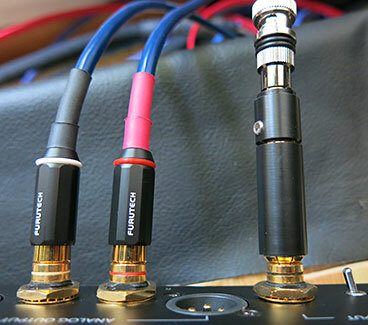 I wanted to set the bar for audio quality high—something pretty close to my reference rig. But in so doing, it would be necessary to limit the number of sources. 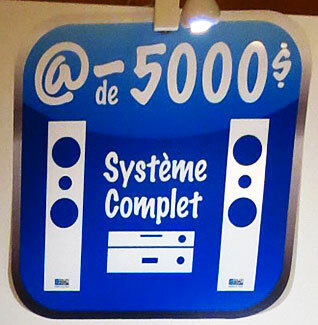 It didn't seem feasible to do both analog and digital front ends at a high level for $5k. I chose digital because I thought it would engage the largest audience and because I could address both CD and computer sourced music. While I love analog and cheer it on, it will have to wait for a follow-up article. So I began with an acoustic goal, the limitation of a digital source, and a total system target of $5000, not including tax and shipping. So with that in mind, who was I going to call upon? 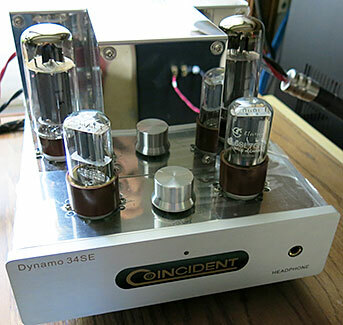 The Dynamo 34SE uses a single EL34B tube for each channel, wired in SET configuration (single ended triode) to give 8 Watts per channel, about the same power as a 300B tube. But whereas a 300B tube might cost anywhere from $220/pr up to $450/pr for a Psvane Grey Bottle TII from China, the Electron Tube EL34B (also from China) used in the Dynamo cost about $40/pr. This obviously freed up a lot of money to put toward quality transformers and other parts. The compact size also contributes to the compact price. 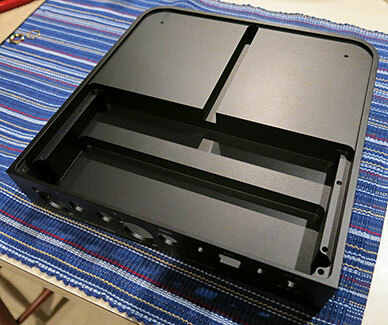 The speaker binding posts are smaller versions of the plastic covered Euro-style ones used on the larger Turbo 845SE integrated. The footprint of the Dynamo is about 1/3 the size of the Turbo (8" x 12" versus 12" x 23", roughly). And where the Dynamo comes in at a solid 22 pounds, the Turbo, weighing 100 pounds, requires a strong person who is knowledgeable about lifting. There were small differences in the Dynamo that pointed to cost savings, but when you consider the Turbo costs $5999—more than the entire rig I am putting together here—those differences become trivial. More importantly, the specified S/N ratio of the Dynamo is an excellent (for a tube amp) 88dB, only 2dB less than the much more expensive Turbo. 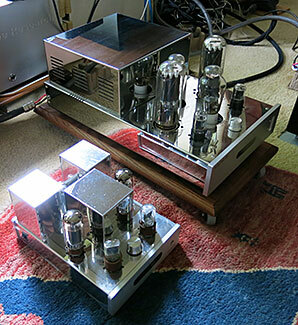 Another consequence of the compact size was the seemingly high heat of the unit which becomes apparent both when adjusting the volume control located between the two input/driver tubes and when turning off the amp with the power switch on the left side of the chassis toward the rear. Concentrating five tubes among three transformer boxes in 2/3 of a square foot creates a noticeable updraft of hot air and a need for caution when adjusting the volume. On the other hand, the compact architecture of polished stainless steel and the thick aluminum faceplate is simply stunning in an eye catching, but not overpowering or ostentatious way—especially when listening in the dark. The EL34 tube gives off a relatively bright orange light and there is a small blue LED on the faceplate to indicate power on. Together these are enough to navigate the room, if necessary, without turning on a lamp. It's a class act in daylight or the dark, and perfectly sized for use in a den or home office. Steven Huang struck a chord with me early on as the name of his company might suggest. Good science combines with quality materials and proven technologies to produce reasonably priced hand-made cables in his boutique company without the high overhead or advertising budget of the more prominent brands. This means, of course, factory direct sales from either his website storefront or across-the-table sales at audio shows where you get to talk directly with Steven and shake his hand. I typically catch up with him at Montreal and Toronto where I usually have to double back multiple times to get a word with him between customers. His wares cover a spectrum of affordability starting with the entry level Impact series, recently upgraded to SE status, on up to the point where you have to be a True Believer in the importance of cabling. My previous experience with his products includes his Statement Silver S/PDIF digital cable which serves as my reference—not that I haven't heard better, but that I could not afford it. In a comparison review of several digital cables the Statement Silver cable struck the high point where value starts to fall away like a booster rocket and the competition heads for the stratosphere. In the photo are the Impact SE interconnects and the Oriton Black Bullet from the United Kingdom inserted between the Statement Silver digital cable and the Calyx DAC. The Black Bullet absorbs micro-vibrations and makes the sound even more like analog at a cost of about $170/pair. (I'm working on a less expensive alternative.) 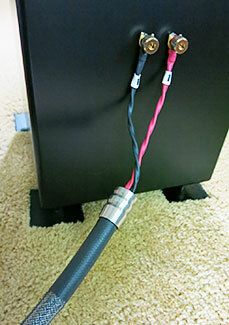 I've also used a specialty Impact SE cable with mini 3.5 stereo pin on one end and RCA pugs on the other. This cable connects the headphone jack on our HDTV to the vintage Tandberg integrated amp in our TV rig where it performs admirably. I was hoping to obtain one of the Geek Out headphone DACs for this project which would have required the mini 3.5 pin to RCA cable, but the review sample did not materialize. So it was on to Plan B, which proved to be a blessing in disguise. Considering that the DAC would also need cables and looking at the target price for the system, I figured the DAC would need to be about $500 or less. After surveying the field and agonizing over both the quality and functionality of various possibilities, I contacted Schiit Audio. I liked their story—two industry veterans (Jason Stoddard of Sumo and Mike Moffat of Theta) teaming up to produce high value products right here in the United States and marketing them directly to the customer to keep the price accessible to entry level enthusiasts. They even came up with a brilliant high-tech corporate name to grab people's attention and have since become a respected portal to the entire industry. Fortunately, they didn't take time to vet my credentials or they would have discovered I don't have an electrical engineering degree and I've almost never done anything with computer audio. In fact, I was so naïve that I had to have Tom come over to help me set up the computer as source. But we'll get to that in a minute. To this point I've collected the Coincident Dynamo 34SE integrated amplifier ($1299), the Tekton Designs speakers ($1000), the Schiit Bifrost DAC ($519) for a total of about $2800 which would seem to indicate there is plenty of room to pull it all together with cables. I'm taking the liberty to assume that if you're reading this, you probably already have a computer with some music either ripped or downloaded on it so that will not factor into the cost. I'm also assuming that either you or your dad has an old CD player with a digital output somewhere in a closet or basement. If not, these can be picked up for cheap on eBay or at garage sales if you (or your dad) wish to play CDs directly rather than ripping them to your computer. A lot will depend on how many CDs you have. Personally, I like handling the silver discs more than mouse clicking on a computer. Normally I use a vintage Sony ES CD player as a transport on an expensive Tube Magic Canada AOS vibration absorbing shelf. It's a very good transport with a remote that is very useful for reviewing purposes. I ditched the Sony player and the now discontinued shelf for a similar vintage Denon DCD-860 with an RCA digital out and a captive zip-cord power cable—something you might pick up for $20. I wanted to keep the playing field level...at the entry level. No Stealth products will be unmentioned. Under the Denon CD player (used as a transport) I used Boston Audio Design TuneBlocks. 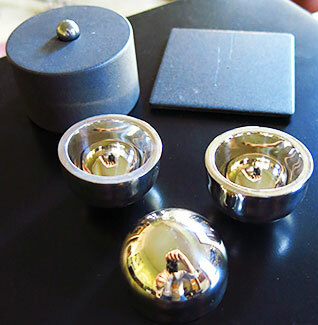 These come in different heights and diameters—the more graphite the better and all now come with tungsten carbide ball bearings. Sets of three range from $159 to $299, but buy according to the amount of vertical clearance you have to play with. They come in 1" and 1.5" cylinder heights. Since the buttons on the CD player get pushed a lot, I chose the TuneBlocks because the components do not slide easily on the tungsten balls and the feet tend to stay put on the shelf. I set up my Radio Shack analog SPL meter on a tripod at ear level in the listening position which equates to about 30 degrees off axis, nine feet from the drivers. The graph is therefore an "in room" reading. Do not confuse this with an anechoic reading on axis at one meter. (An on-axis anechoic measurement would most certainly be a lot smoother and have a narrower deviation.) It shows pretty well what I heard—a little more energy in the upper midrange than the lower midrange. There is no major bass boom and the bass is still quite strong down to the low 30Hz range. It was nice to have the subwoofers, but for most music this speaker doesn't need them. Only when I compared them with my Kharma speakers whose tweeters are above my ear level did I recognize that the Tekton do not have a really high soundstage, nor should you expect it from a speaker of this height. The music has an excellent sense of space and the instruments have good three dimensional qualities with lots of body. Aesthetically, there is not much to say about its basic form and black satin finish. 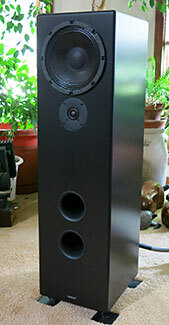 Countersinking the mid-woofer would improve the looks a bit, but might require a thicker baffle and higher cost. It's important to recognize that this speaker is designed for maximum sound quality at its price point. This basic presentation seems to target young people who move a lot, or have a young family that makes the speaker prone to dings and crayons. (The satin black should be easy to touch up or re-paint.) Satin black also works for those who simply care about the music and don't need to impress anyone and it is by far the most popular color offered. Visually, they disappear when listening in the dark. You can have a fancy veneer if you like or red or white, but only at a higher price. For me, I could sit and enjoy music endlessly with the Tekton Lore Reference and that's why I recommend it so highly. A word of caution, however—being relatively light and having a small footprint, you might want to consider aftermarket outriggers to improve their stability if you have a lot of traffic in the room, particularly wild dancing children. Like its big brother, the Turbo 845SE, the Dynamo is basically a power amp with a volume control, but even more minimal. There is only one RCA input and no remote. It seems targeted for a small room or elegant office setting and in my large listening room it would have been very inconspicuous save for the beautiful polished stainless steel chassis and transformer covers. It is as elegant as the speakers are plain, but with eight very fine watts and a relatively large power supply in the amp, and 96dB/W/m efficiency in the speaker, this is an extraordinarily successful combination. The dynamics belie the fact that there is no pre-amplification involved, just one line input, an attenuator and a power amplifier. This simplicity opens the door for very fine focus and outstanding transparency which in turn yield a very well defined soundscape with lots of air and inner detail. There was a softness in the mid to lower bass—something not uncommon with tube amplifiers, and something that might easily be attributed to the two-way tower speaker. Yet even with this minor shortcoming the entry level rig was sounding better than my reference system in most respects. It was downright scary. That's what happens when you combine SET tubes in Class A with point-to-point wiring and zero negative feedback circuitry. The Bifrost was the last piece of the puzzle to come in and it wasn't terribly impressive right out of the box. I set it up to run 24/7 and after a few days I was able to experience why it was so highly regarded. It readily revealed the difference between the Audio Sensibility Statement Silver digital cable and another, less expensive cable I had on hand. The Bifrost sounded better with tube amplification than what I expected from reading reviews which were done with solid state amplification. No surprise there. The real fun came when I hooked it up to my computer and was very impressed with the music that resulted. Differences between Red Book files and 24-bit/192kHz files were readily apparent and I finally got a glimpse of what all the hoopla was about. (I still think it is hoopla—good music is enjoyable no matter what the format, and I'm not about to sell off my LPs. In fact, I'm hoping people will soon start to dump their CDs. My net is cast.) The ripped copy of a James Taylor song recorded live sounded better through USB than playing back the original CD through the RCA input...but you probably already knew that. One of the things I enjoy most about this hobby is the occasional Ah-Ha! moment, frequently followed by a What If...? Just when I thought I was finished with my listening I had one such moment. I'm a big fan of ERS paper—those sheets that absorb EMI and RFI. I've got it in my tuner, in my transport and even shielding the cartridge lead wires on my tonearm—all with great effect. What if I were to slip a piece of it into the Bifrost? Like with everything else there is the warning discretely silk-screened on the back panel: No user serviceable parts inside. Well, I wasn't going to service anything. I was just going to tape a piece of ERS to the top of the chassis... so I dove in. It is beautiful inside. The build quality is every bit as good as others have claimed and the brilliant red circuit boards pushed my Christmas button. Not only that, but there is a fuse inside, which presented another opportunity. I dabbed the glass cylinder with AVM (anti-vibration magic), which I fondly call Blue Tube Goop. When new it is about the consistency of nail polish, but my vintage supply now has the viscosity of toothpaste. Nevertheless, I was able to coat the glass on the fuse and fold over a 3" x 8" piece of ERS and tape it to the inside top of the chassis so it didn't cover the transformer which would likely be the hottest part in the circuit. What I hadn't planned on was the need to get the little LED lights back into the tiny holes on the faceplate, but skills learned assembling plastic model war planes back in the 1950's served me well. 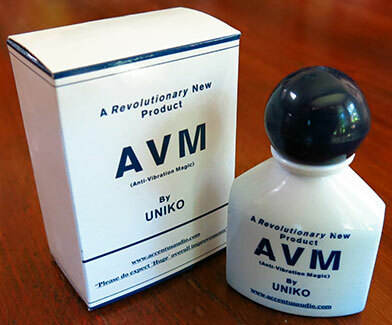 The AVM takes time to harden completely, but the immediate result was simply stunning. The improvement in focus was blatant and the consequence of lower background noise was the revelation of even lower level detail and slightly improved dynamics. The bass, in particular, tightened up considerably thereby improving the transition from bass to midrange. 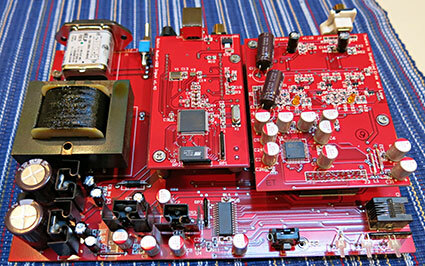 It still was not rock solid like you get from solid state amps with huge damping factors, but it was much better—to the point of "no complaint". Midrange and treble tightened up as well with improved shimmer on the cymbals being an obvious example. Words of African dialects became recognizable, if not comprehended, on Planet Drum. 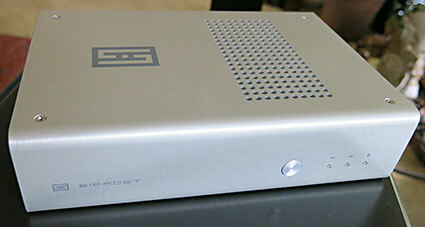 The ERS and AVM took the Schiit Bifrost to the next level and brought the rest of the system right along with it. This was of course good news and bad news, as my reference rig was now even further depreciated.